B cells are white blood cell of the lymphocyte subtype (PMID: 18897986). They are key players in the adaptive immune response for their critical role in generating humoral immunity. Additionally, they contribute directly to cellular immunity as bona fide effectors, secreting inflammatory cytokines, serving as professional antigen-presenting cells (APCs), and modulating immune responses as regulatory B cells (PMID: 25324123). They also maintain the architecture of secondary lymphoid organs and promote the generation of tertiary lymphoid tissues at sites of chronic inflammation (PMID: 22224772). B cells have been implicated in several malignancies and pathogenesis of various autoimmune diseases. B cell malignancies are often characterized by lost or gained expression of surface markers compared to corresponding normal B cells. B cell development takes place in bone marrow, but after expression of a functional,non-autoreactive B cell receptor (BCR), naïve B cells leave the bone marrow and circulate through the body via the blood stream. Upon activation, B cells either develop into plasma cells or migrate into secondary lymphoid organs like tonsils, spleen, or Peyer’s patches for further differentiation (PMID: 18725575, 17582343).All mature B cells express the Pan B cell markers CD19, CD20 and CD22 (PMID: 1373518, 26478008,21151033). Note: Frequencies of distinct subsets varies according to mouse strain, age, and several other factors, thus an average number cannot be provided (PMID: 18544662). There are 3 principal classes of B lymphocytes: B1 B cells, and B2-derived marginal zone (MZ) or follicular (FO) B cells (PMID: 21151033). A small percentage of these B cells produce IL-10 and are referred to as regulatory B cells (B reg). Mouse B cells are additionally classified as transitional/immature, naïve B cells, memory B cells, and plasma cells. Further subsets of memory B cells and plasma cells are identified based on their Ig isotypes expression (IgM, IgD, IgG, IgA). B-1 B cells develop from the fetal liver and disseminate to the periphery. They are principally found in the pleural and peritoneal cavities. Based on the surface expression of CD138, CD43 and CD5, 2 distinct subsets are recognized: B-1a and B-1b. B-1a B cells are the most abundant and express CD5. B1 cells lack CD5 expression. They are involved in innate-like immune responses and are the main producers of natural antibodies. Interestingly, they express specific TLRs and thus, can mount a response in absence of (BCR) triggering. B-2 B cells develop from bone marrow, migrate to the periphery as immature B cells, and mature once they reach the spleen or other secondary lymphoid organs. They can give rise to both marginal zone (MZ) or follicular B cells (FO). The latter are considered the conventional B cell subset and are progenitors for the developmental B lymphocytes subsets naïve, activated, GC, memory, and plasma cells (PMID: 22224772). B cells in lymphoid organs reside in structures called follicles. In response to antigen encounter within the follicle, naïve B cells initiate the formation of germinal centers (GC). These transient structures are critical for the development of the adaptive humoral response, and are the location where B cells differentiate and proliferate to generate long-lasting immunological memory. Within GCs, B cells undergo IgV somatic hypermutation, affinity maturation, and Ig class switching, leading to the development of switched memory B cells and plasma cells. Elucidating the dynamics and mechanics of the GC reaction is a major research subject in adaptive immunity, immunodeficiency, and B cell diseases, and of critical importance for the development of improved vaccination strategies. Lymphoid tissues must be dissociated into a single-cell suspension for many downstream applications, including isolation of cell subpopulations, cell culture, or flow cytometry analysis. Dissociation can be accomplished fully automatically using a gentleMACS™ Dissociator and specific Tissue Dissociation Kits (e.g., Spleen Dissociation Kit, mouse). A special protocol for the preparation of single-cell suspensions from mouse spleen without enzymatic treatment can be downloaded from the Related Resources panel to the right. Alternatively, tissues can be dissociated using a manual procedure. For details about sample preparation of lymphoid tissues and bone marrow, see the corresponding chapters. Miltenyi Biotec has developed numerous products for the magnetic separation of the various B cell types and subsets that can be found in mouse lymphoid tissue. For details on MACS® Cell Separation Technology, see the MACS Handbook chapter Magnetic Cell Separation . B cell biology and mechanisms of action are still actively researched, and the analysis of whole B cell compartments enables elucidating signal requirements for B cell activation, induction of proliferation, and differentiation. Signal transduction, immunoglobulin class switching, and somatic hypermutation in B cells are other active areas of research. Depending on experiment objectives, all B cells can be isolated from single-cell suspensions of lymphoid tissue by positive selection using the CD45R (B220), the CD19, or the CD22 Microbeads, mouse. Alternatively, the Pan B Cell Isolation Kit II, mouse offers a fast and efficient method to separate untouched B-1 and B-2 B cell subsets, and because the kit depletion cocktail does not include CD43 or CD11b, which might be expressed on malignant target cells, the kit is optimal for use with different mouse models of human diseases. Isolation of untouched B cells. Pan B cells were isolated from mouse spleen using the Pan B Cell Isolation Kit, an LD Column, and a MidiMACS™ Separator. The cells were fluorescently stained with CD19-PE and CD4-FITC and analyzed by flow cytometry using the MACSQuant Analyzer. Cell debris and dead cells were excluded from the analysis based on scatter signals and propidium iodide fluorescence. The B Cell Isolation Kit, mouse has an updated, rapid protocol that enables isolating untouched resting B cells using cocktails designed to deplete activated B cells, plasma cells, CD5+ B-1a cells, and non-B cells. The isolated B cells exhibit high cell viability and recovery. High recovery of isolated BC45R+ B cells. Untouched B cells were isolated from a mouse spleen single-cell suspension using the B Cell Isolation Kit, a MidiMACS Separator, and an LS Column. High recovery of isolated BC45R+ B cells. Untouched B cells were isolated from a mouse spleen single-cell suspension using the B Cell Isolation Kit, a MidiMACS Separator, and an LS Column. The CD138+ Plasma Cell Isolation Kit, mouse leverages the correlation between expression of CD138 on cells of the B cell lineage, and their developmental stage, location, and adhesion. First expressed on pre-B and immature B lymphocytes in bone marrow, CD138 expression is lost in circulating and peripheral B cells. Upon differentiation of B cells into plasmablasts and plasma cells, expression of CD138 is recovered. 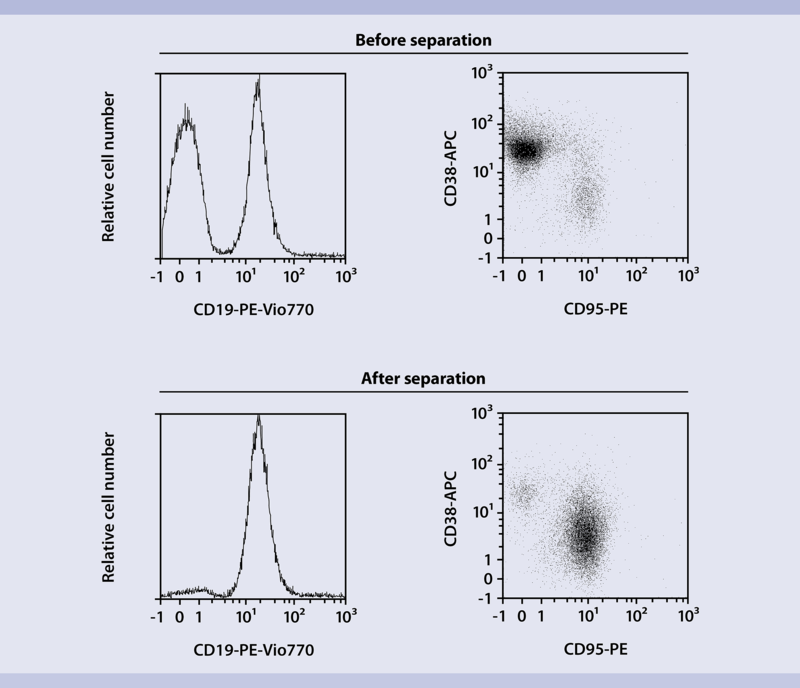 CD138+ Plasma cells efficiently isolated in a two-step process. Cells were isolated from a mouse spleen single-cell suspension using the CD138+ Plasma Cell Isolation Kit, an LD and two MS Columns, a MidiMACS and a MiniMACS™ Separator. The cells were fluorescently stained with CD45R (B220)-APC, CD19-FITC, and CD138-PE. Cell debris and dead cells were excluded from the analysis based on scatter signals and propidium iodide fluorescence. 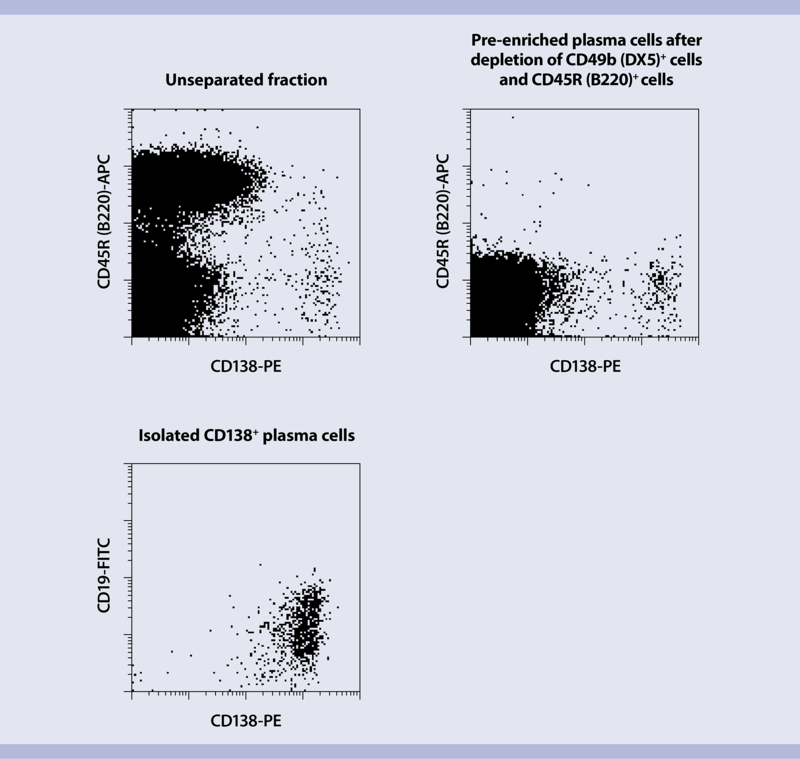 CD138+ Plasma cells efficiently isolated in a two-step process. Cells were isolated from a mouse spleen single-cell suspension using the CD138+ Plasma Cell Isolation Kit, an LD and two MS Columns, a MidiMACS and a MiniMACS™ Separator. The cells were fluorescently stained with CD45R (B220)-APC, CD19-FITC, and CD138-PE. Cell debris and dead cells were excluded from the analysis based on scatter signals and propidium iodide fluorescence. Examining and characterizing B cells in GC can support improved vaccine strategies and a better understanding of B cell diseases. B cells within GC express ligands for peanut agglutinin (PNA), allowing for their identification and isolation. PNA is a plant lectin protein derived from the fruits of Arachis hypogae, which specifically binds to terminal non-reducing galactose residues on the cell membrane. This affinity for PNA is leveraged by our new Germinal Center B Cell PNA MicroBead Kit, mouse, to separate GC B cells following primary immunization with T-dependent antigens. Isolation of germinal center B cells from mouse SRBC-immunized spleen. Cells were separated using the Germinal Center B Cell (PNA) MicroBead Kit, an MS Column, and a MiniMACS Separator. Cells are fluorescently stained with CD19-PE-Vio® 770, CD38-APC, and CD95-PE and analyzed by flow cytometer using the MACSQuant Analyzer. Cell debris and dead cells were excluded from the analysis based on scatter signals and propidium iodide fluorescence. To isolate B cell subsets that are not defined by a single antigen or covered by a specific Miltenyi Biotec solution, we offer a range of directly conjugated MicroBeads and indirect MicroBeads that can be combined to separate the subset of choice. MicroBeads for indirect magnetic labeling, namely Anti-FITC and Anti-PE Microbeads, have been used to separate CD23+ follicular B cells and CD21+CD23– MZ B cells from mouse spleen (PMID: 16880262). Miltenyi Biotec offers a broad portfolio of products for the routine cell surface and intracellular staining of B cell-specific markers that can be used to examine B cell populations and subsets by flow cytometry. Our innovativeREAfinity™ antibodies are ideal for the analysis of B cells with the MACSQuant® Analyzer. Use MACS Flow Cytometry – multicolor Panel Builder to plan and order customized panels. MACSCytokine Assays (CSA) enable the easy enrichment, analysis, and enumeration of viable cytokine-secreting cells. These unique tools, allow the detection of cytokine secretion at single-cells level and multiplexed phenotyping.As an example, the Mouse IL-10 Secretion Assay was instrumental in showing that in neonatal spleen cells activated by CpG oligodeoxynucleotides, CD45R+ and CD19+ B cells and not CD3+ T or CD11b+ myeloid cells were primarily responsible for the production of IL-10 (PMID: 15845451). Miltenyi Biotec offers a broad portfolio of over 150 cytokines and growth factors, as well as related proteins, to culture and stimulate B cells, and to investigate their function. For example, our high quality cytokines and CpG oligodeoxynucleotides are perfectly suited for the activation and expansion of mouse B cells for further studies. B cell development in bone marrow is a tightly regulated process, with stepwise recombination of V, (D) and J gene segments coding for the variable (V) region of the immunoglobulin (Ig) heavy and light chains. Throughout adulthood, pre-B and immature B lymphocytes can be found in bone marrow. For additional information about B cells in bone marrow, see B cells from lymphoid tissues. Mononuclear cells are typically isolated from bone marrow before subsequent separation of B cells. For details about sample preparation of lymphoid tissues and bone marrow, see the corresponding MACS Handbook chapters..
Miltenyi Biotec has developed numerous products for the magnetic separation of the various B cell types and subsets. For details on MACS® Cell Separation Technology, see the MACS Handbook chapter Magnetic Cell Separation . In mice, CD138 is expressed on pre-B and immature B lymphocytes in the bone marrow. This expression is lost when B cells emigrate into the periphery, and is absent on circulating and peripheral B cells. Only upon differentiation into plasmablasts and plasma cells, do B cells express CD138 again (PMID: 2519615). Thus, our CD138+ Plasma Cell Isolation Kit, mouse is optimal for the isolation of CD138+CD45R(B220)low/–CD19low/– in bone marrow.